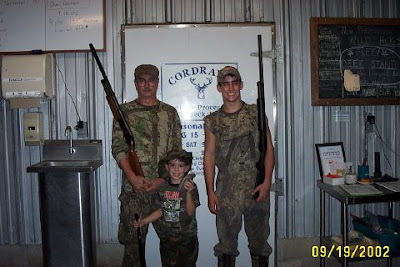 If you have interesting photos from your wild game camera upload to our Facebook page, Cordray's, to here on the Cordray's blog or email them to me at claudia@cordrays.com and we'll let everyone see. You don't have to tell us exactly where you saw him, but you could give us a hint! Click here for an interesting article on how local farms are joining the CSA, Community Supported Agriculture, movement. Our CSA is a little different from what's in the article and video. We don't ask that you pay upfront or by the year. We also don't deliver shares weekly or monthly. Each family's beef use varies widely so it would be hard to provide monthly or weekly installments. Our shares let you team with 7 other families to share one animal. That way, you get a variety of cuts that equal 1/8 of the total carcass. If it takes your family 2 months to use yours and another family 6 months, you can reorder for your family whenever you want. We also do all our own cutting and packaging. We don't do the actual slaughter on premises, but the whole sides are returned here in just a few days to remain under our watchful care as we cut and vacuum seal the portions for your family's share. What we do have in common is the sincere desire to provide the highest quality beef from cows born and raised on our farm. It's exciting to see whole communities working together to help the family farm survive while providing nutritious wholesome food for everyone! This photo's just to make you hungry! The temperature on the truck mirror says 99 degrees, but we got it! Call before you come by. One of the baby chicks we hatched from the incubator laid an egg!!! Cordray Farms will be opening our on-farm store in 11,952 minutes! At least that's what the counter on the Cordray's blog says! 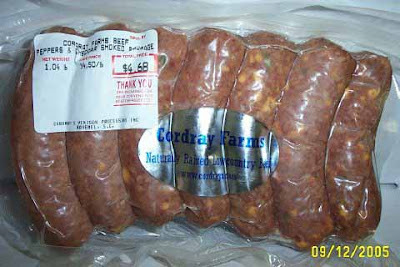 Welcome to all of you who've joined our blog and Cordray Farms Beef list over the summer. We've met many of you as you've stopped by for Beef Shares and Beef Sides. 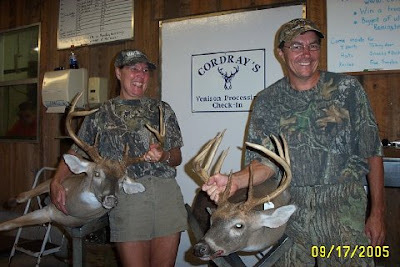 With the opening of deer hunting season, we will have our on-farm retail butcher shop open 6 days a week, Mon - Sat. 9 am to 10 pm. We're open Sunday evenings from 6 pm to 10 pm. We are closed during the day on Sundays. We'll have a fully stocked meat case with individually vacuum sealed steaks, small family sized burger packs, and beef roasts of all kinds. We also feature a variety of smoked beef products throughout the year. Stay tuned to the blog and the email list and I'll let you know what we have on hand each week. I'll contact you again Friday, the 14th, to let you know what's in the case on opening day, Saturday the 15th. If you are interested in fresh, never frozen, steaks, you'll need to come in that first weekend as these sell out first! We look forward to seeing you! Someone left us a red and white igloo cooler - way to new to be ours! We are holding it for you. Thanks so much to Ambrose Farms! The fine folks at Ambrose Farms have agreed to swap links with us and graciously sent out an email telling all their CSA folks about Cordray Farms Beef. As we all work together to bring fresh, nutritious, local food to the Lowcountry, we encourage you to check out their website! Click here. 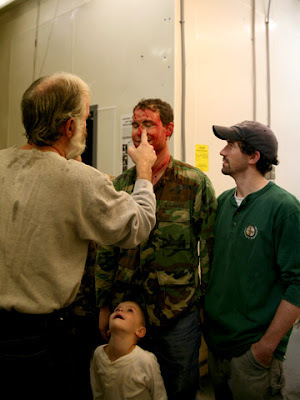 Archived photo - Tell us the story. When I post old photos, it's not easy to label them with the correct name and I seldom remember the events that lead up to the trophies in the pictures. I hope you'll email me some names and stories to go with the photos! Just hit "Comments" and fill us in with all the details! If you don't have a blogger log-in, just use "Anonymous" and include your name in the post itself. Lots of weapons for a squirrel! 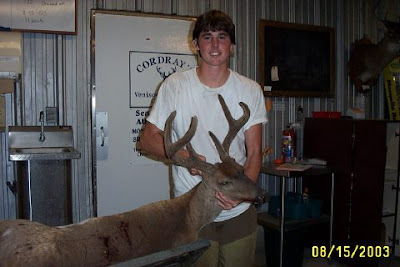 A trip down memory lane with the biggest buck of 2008 for starters! As we all get ready for the big day, we'll be reposting some of the memorable photos from the past. 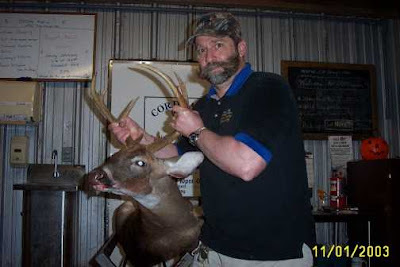 So let's begin with the BIG BUCK Winner of 2008, Bill McKinnon. 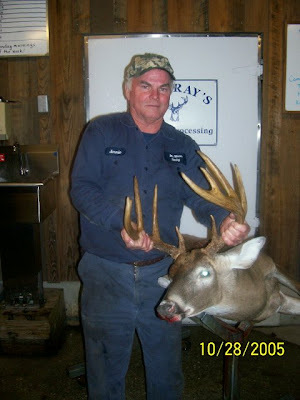 The buck's live weight was 253 lbs. with a dressed weight of 158.2 lbs. 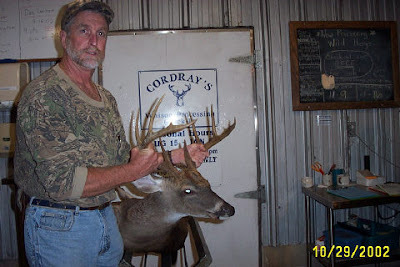 That's the biggest buck we've ever had at Cordray's! 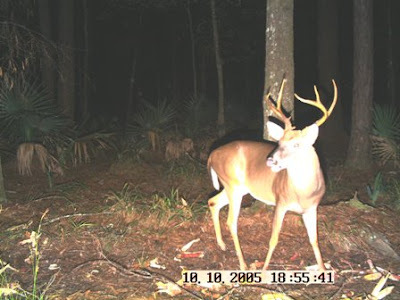 There was an informative article by Tommy Braswell in yesterday's Post and Courier on the upcoming deer season. If you missed it, click here. Watch the counter at the bottom of this blog to see exactly how long until the first minute of the first day!